To coincide with a survey of 2,400 people looking into sleep habits (survey here), IKEA has 'activated' (I feel dirty…) a neat little stunt in Australia. 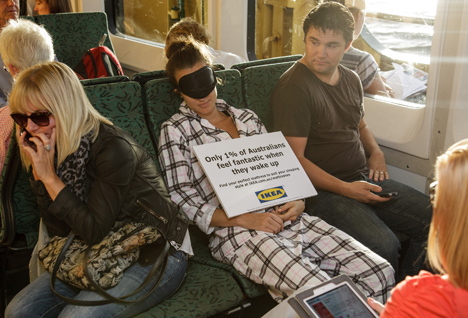 A team of ‘sleepers’ rode public transport – including a boat – in Sydney, Melbourne and Brisbane at peak hour traffic in pyjamas, encouraging fellow travellers to consider buying an IKEA mattress. The series of simple and seemingly inexpensive stunts were carried out by One Green Bean PR with outdoor, print, digital, social and PR activity running in support.